From 4 April 2016, Queensland Urban Utilities will progressively remove the redundant recycled (purple) water meters in some areas of the Rochedale and Arise Estates in Rochedale. We carried out investigation and design work on a system to extend the longevity of major water mains on Mains Rd, Sunnybank and Pinelands Rd, Sunnybank Hills. Queensland Urban Utilities will install a 430 metre sewer line through park reserve on Ashridge Road, Darra, to increase the capacity of the local sewerage network. Construction of a cross-river water pipeline to connect two water supply zones - the Bartleys Hill reservoir in Ascot and the Wellers Hill reservoir in Murarrie. Work is underway on the installation of a new sewer main in Calamvale. Work is now completed on a new sewer main in Eight Mile Plains. A new sewer rising main was constructed along Sandgate Road, Virginia. The sewerage maintenace program installs new sewer mains which connect to existing sewer mains to assist in wet weather events. The project has protected 5 sewer maintenance holes and 3 sections of pipe along a sewer line which follows the alignment of Kedron Brook from South Pine Rd, Enoggera to Grange Rd, Grange. We are currently working at 26-32 Sandford Street, St Lucia, to construct a new maintenance hole, replace the damaged sewer pipe and install new property connections. A project to replace asbestos cement water mains in Carina, Carina Heights and Camp Hill will start in late November 2015. A new 430 metre, 500mm diameter sewer main in West End which improves capacity and joins the Toowong and South Brisbane sewer networks. The Wickham Street Sewer was built over 90 years ago. This sewer upgrade is needed to ensure the sustainability of the network and to cater for future growth and development. The upgrade was to assist in increasing the capacity of Woolloongabba’s sewerage system to cater for the increasing development and population density in the area. Springfield Lakes properties will all be connected to almost four kilometres of new water main by the end of September 2015. We constructed a new sewer in Silkstone to ensure the sustainability of the network and provide sufficient capacity for future growth and development in the area. Work has been completed on the Gatton Sewer Main Upgrade project to increase the capacity of the local sewerage network. A project to improve the capacity of the water network in Aratula. New water mains have been installed on the west side of Lamington Park Rd from Coburg Rd, continuing northbound, turning a sharp right into Kidston St and ending near King St.
We are rolling out the Water Main Replacement Program across the Scenic Rim, to improve the reliability and integrity of the water network. 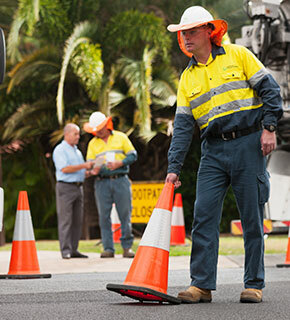 Work is underway to upgrade the Lowood sewer network. We are investing around $350,000 into replacing the sewer maintenance holes and relining the existing sewer system at Somerset Dam to extend its operational life. A project to extend Fernvale’s sewer system along the eastern and western sides of Clive Street has been completed. The water main replacement works in East Street, Esk have been completed. A $620,000 upgrade to Fernvale’s Sewer Network adding 780 metres of new sewer pipes between the Brisbane Valley Highway and Banks Creek Road, Fernvale was completed in August 2015. Over 4.2 kilmotres of new water mains along the D’Aguilar Highway from the Kilcoy Pastoral Company through to Graham Street and up to the Saleyard Road Reservoirs was completed in July 2015. Construction of a new 400 metre section of water main in William Street close to the footpath between Seib and Kennedy Streets, Kilcoy is now complete.